Information: Tatiana Nikolova-Houston, creator of "illuminations" and dance description translator. Tatiana Nikolova was born in Bulgaria in 1961. Her father, a self-taught artist and theatre director, inspired her love of the arts. She studied Landscape Architecture and designed parks rich in color, flowers, and spaces for recreation and meditation. 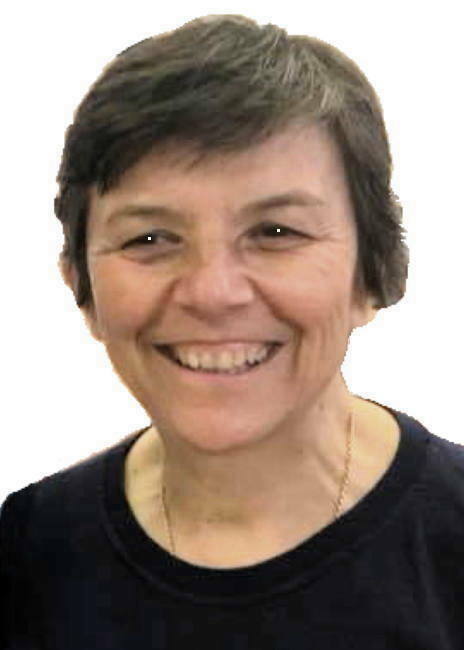 In 1990, Tatiana came to America, married Ron Houston, and received a Master’s degree in Religious Studies and Library and Information Science, studying and preserving South Slavic (Bulgarian) medieval manuscripts. Her doctoral study revealed "the secret history" of the Balkans during the Ottoman rule (1393 to 1878) by studying manuscript marginal notes. After graduation in 2008, she started to re-create and re-interpret Byzantine and South Slavic iconography and manuscript illuminations, and to educate Western audiences about the simple and meaningful illuminations of Slavic scribes by using gold and metallic inks and acrylic paints, embellished by Swarovski crystals. The illuminations reflect the joy of spirituality, emphasizing the themes of the Light within and without and the Tree of Life as major inspiration. Since 2009, "Sacred Illuminations" participated in more than fifty juried shows, including more than twenty juried solo gallery exhibits, and forty-five festivals, bazaars, and fairs, in Texas, New York, Colorado, Pennsylvania, Holland, and Bulgaria. "Tree of Life  Holy Spirit" has been published in Christian Century, L-Magazine, and Behold. Kamerkoor Kwintesens used her "Tree of Life  Infinity" for its production of Arvo Part's Adam Lament in the Hague, Holland. 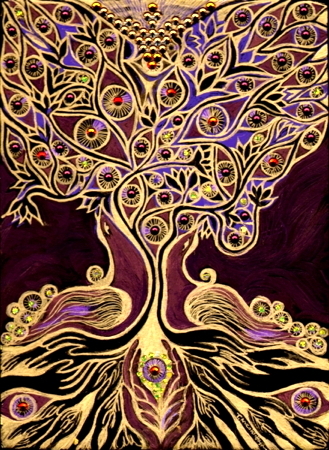 "Tree of Life  Eyes and Hands" (see photo at right above) served as a book cover for Peter Traben Haas' Beautiful Prayer. The catalog includes more than 300 titles. Tatiana translates dance descriptions from Bulgarian to English for her husbnand, Ron Houston. 2002-2008  Ph.D. (Doctor of Philosophy in Information Science), The University of Texas atAustin, School of Information. Outstanding Dissertation Award nomination. 1998-2001  М.L.I.S. (Master of Library and Information Science), The University of Texas atAustin, Graduate School of Library and Information Science. 1996-2000  M.S. (Master of Science in Biblical and Related Studies), Abilene ChristianUniversity, Abilene, Texas. 1992-1995  B.S. (Bachelor of Science in Biblical and Related Studies), Institute for ChristianStudies, Austin, Texas. 1980-1985  M.S.L.A. and B.S. (Master of Science in Landscape Architecture and Bachelor of Science), Institute of Forestry, Sofia, Bulgaria. 2006  Summer Research Lab in Digital Humanities, University of Illinois at Urbana-Champaign. 2001  Medieval Slavic Summer Institute (certificate), Hilandar Research Library, Ohio State University. 1999  Digital Preservation of Medieval Manuscripts (certification), Sofia, Bulgaria. Bulgarski Narodni Hora I Tantsi, Sofia: Meditsina I Fizkultura, 1976, p.142. "Slavic Medieval Manuscripts, Part II: Historical, Archival, and Aesthetical Value andVisibility," Catholic Library World, 2013, Volume 83, No.2, pp. 112-121. (Peer reviewed article). "Slavic Medieval Manuscripts, Part I: Origins, Preservation and Access," Catholic Library Journal, 2012. Volume 83, No.1, pp. 26-32. (Peer reviewed article). "Do Ohaio I Nazad: Po sledite na Bolgradskija Sbornik ot Hilendarskija tsentur." (To Ohioand Back: Tracing the Bolgrad manuscript at the Hilandar Research Library) In IstoriaSlavyanobulgarska I Duhovnia Zhivot prez 30-40-te Godini na XIX vek" Jubileen sbornik ('The Slavo-Bulgarian History and the intellectual life during the 30-40s of the 19thcentury': Anniversary edition, Akademik Ivan Radev, ed. V. Turnovo: UniversitetskoIzdatelstvo "Sv. Sv. Kiril I Metodii," 2013, pp. 127-138. "Otets Paisii I Bulgarskata Istoria" (Father Paisii and the Bulgarian History). Translation of James Clarke's original article. In Istoria Slavyanobulgarska I Duhovnia Zhivot prez 30-40-te Godini na XIX vek" Jubileen sbornik, Akademik Ivan Radev, ed. V. Turnovo:Universitetsko Izdatelstvo "Sv. Sv. Kiril I Metodii," 2013, pp. 43-66. "Increasing the Visibility of Slavic Medieval Manuscripts." Roland, D., Wicks, D.A., and Freeburg, D. (eds.). (2012). Advances in the Study of Information and Religion, 2. Retrieved from http://drc.library.kent.edu/handle/2374.KENT/1432/browse?type=title. "Ot Bolgrad do Ohaio: Po sledite na Bolgradskia Sbornik ot Hilendarskia NauchenTsentur" (From Bolgrad to Ohio: Tracing the Bolgrad Manuscript from the Hilandar Research Library). Za Bukvite: Kirilo-Metodievski Vestnik O Pismenech. Volume 38,2012. "Building the Virtual Scriptorium," chapter 14 in the book Digitization Perspective. Coauthored with Ron Houston. Sense Publishers, UK, Netherlands, 2011. (Peer reviewed book). "Colophons and Marginalia in the Manuscripts of the Etropole Literary School:Documentary and textual analysis, comparative study and attempt of moderninterpretation," in Etropole Literary School and Bulgarian Seventeenth Century. Sofia: National Library "Sts. Cyril and Methodius," 2011. "Pripiski ili colophons: Marginalni belezhki v juznoslavyanski rukopisi" Marginalia or colophons: Marginal notes in the South Slavic manuscripts, in Za bukvite, Volume 33, November 2010. Article written by Ilia Pehlivanov, editor-in-chief, about the dissertationand research on the topic of marginalia. Also included in the issue, article on the artexhibit "Sacred Illuminations," featured in Church Holy Trinity, Gabrovo, June 13-August 3, 2010. Published by the University of Library and Information Science,Bulgaria. Also available online at:http://www.zabukvite.org/newspapers/ZaBukvite33.pdf. "Marginalia and Colophons in Bulgarian Manuscripts and Early Printed Books," chapter in the Journal of Religious and Theological Information. Volume 8, Numbers 1-2, 2009. (Peer reviewed article). "Bulgarian Librarianship: Surviving change through international cooperation." Chapter in the book series Advances in Library Administration and Organization: "Culture,context and history in the post-Soviet world of information institutions, resources and practices." Volume 27, 2009. (Peer reviewed article). "Black and white and red all over: The enemy within and without, as revealed in Sovietpropaganda pamphlets." CREES Newsletter. November-December 2008. "For the sake of our future, preserve the past," by Dr. T. Palaima, Austin AmericanStatesman, May 15, 2008. Honorable mention of the dissertation. "Building the Virtual Scriptorium," Policy Futures in Education. Symposium Journals series. Volume 6, Number 1, 2008. Coauthored with Ron Houston. "The Discovery of the Hidden Manuscripts," Art Libraries Journal. Spring 2006. "Using Participatory Design to Improve Websites." Selected as Editor's pick for Informed Librarian Online for November 2005 issue. "Using Participatory Design to Improve Websites," Computers in Libraries, Vol. 25, Number 9, (October 2005). Feature article. "The Discovery of the Hidden Manuscripts," paper presented at 71st IFLA Congress, Oslo, Norway, August 14-19, 2005. Available on CD-ROM and online in English and French. 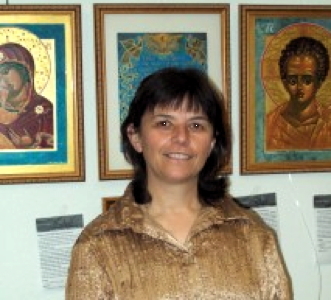 "MSSI Alumna Inspired to Preserve Bulgarian Orthodox Manuscript Collections," Cyrillic Manuscript Heritage 17 (June 2005). "Bulgarian Theological Manuscript Collections: Issues of Preservation and Access andCollaboration Between American and Bulgarian Institutions," paper presented at2005 ATLA Conference, Summary of Proceedings: Fifty-ninth Annual Conference of the American Theological Library Association. 2005. "Honoring Cultural Differences: Change Management in Bulgarian Special Collections," Global Media Journal , 2:4, Spring 2004. Available at:http://lass.calumet.purdue.edu/cca/gmj/SubmittedDocuments/Spring2004/grad_research/non_refereed/unknown.htm. Byzantine Hypertexts, TEKKA, 1:3, 2003. Online journal on a very innovative area of researchof hypertext theory and application, available at: http://www.tekka.net/login/. "Byzantine Medieval Hypertexts,"Website at: www.ischool.utexas.edu/~slavman/hypertexts.Created May 2002. Nominated and awarded by TLC Department. Also in German.http://translate.google.com/translate?hl=de&sl=en&u=www.ischool.utexas.edu/~slavman/hypertexts. "The Continuing Mystery of the Clarke Manuscript," Cyrillic Manuscript Heritage 12 (December 2002), p. 4-5. "Jak pokonałam przepaść technologiczną celem ratowania słowiańskich rękopisów." Central Archives of Historical Records, Warsaw, Poland. Available at:http://www.archiwa.gov.pl/agad/electro/nikolova.html. November 2002. "In Regard to the Copy of Istoria Slavyanobolgarskaya at the Hilandar Research Library inOhio, U.S.," Conference Proceedings. Sofia, Bulgaria: Byzantine-Slavic ResearchCenter "Ivan Dujcev," 2002. "Digitization for Preservation and Access: a Case Study from Historical and ArchivalChurch Institute, Sofia" Conference Proceedings, Sofia, Bulgaria: Bulgarian Academyof Science, 2002. "Questing Across the Digital Divide for Hidden Treasures of Slavic Manuscripts," Computers in Libraries, April 2002. Feature article. Available at:http://www.infotoday.com/cilmag/apr02/Nikolova-Houston.htm. "Slavic Medieval Treasures from Bulgaria," Website athttp://www.gslis.utexas.edu/~slavman. Created May 2002. "The Internet and the Virtual Scriptorium of Slavic Medieval Manuscripts: Preservationand Access," Conference Proceedings. Sofia, Bulgaria: Union of Librarians andInformation Services Officers, 2001, p. 204-216. Arap. Translation by Tatiana Nikolova-Houston of dance description from Tantsova samodeynost. Baldüzkinata. Translation by Tatiana Nikolova-Houston of dance description from Tantsova samodeynost. Kukuvičkata. Translation by Tatiana Nikolova-Houston of dance description from Tantsova samodeynost.